Chance is a very messy drinker. In fact he seems to enjoy laying in his water bowl. His bib area is wet more than it is dry. Other than constantly wiping him off every time he gets a drink, is there an alternative to keeping him from looking so scraggly? Do they outgrow this stage? Most outgrow the stage, but not all. My biggest worry was that with that thick neck fur being constantly wet they can actually produce mold. Extreme, but i have read about it happening. My female was similar. Constantly wet, drooping cups of water across the floor, i wondered if she actually drank any of it. We went with a bib option for her in the puppy phase. You could improvize with a bandana if needed. Just reverse if US Cowboy style. There are products available though. Look for items with an elesticized tie. The standard bands that you just tie into a know will falldown around the neckline and wont help a lot. Here in the New England area we think of it as a lobster bib. That sounds like Chance. He leaves big puddles around the water bowl. Now I am going to be worried about MOLD! BonBon has the same problem. We always wipe his face after he drinks water. When nobody is around, he uses corners, couch etc. Everything becomes dirty very quickly. Yeah, that didnt seem to work out so well. Chance thinks he has a pool now. Aside from the bib or bandana idea, try a "No Spill Bowl". I think we got ours at Petco. Rory's Dad wrote: Yeah, that didnt seem to work out so well. Chance thinks he has a pool now. Thanks! I had no idea that such a thing existed. It shouldn't bother you too much that Chance has wet bib area most of the time. By the looks of it with his paws inside the bucket of water, he loved cooling his paws. Just let him be. No need to overly dry his fur all the time as it will dry out naturally. Brush his fur instead once it is semi-dry. 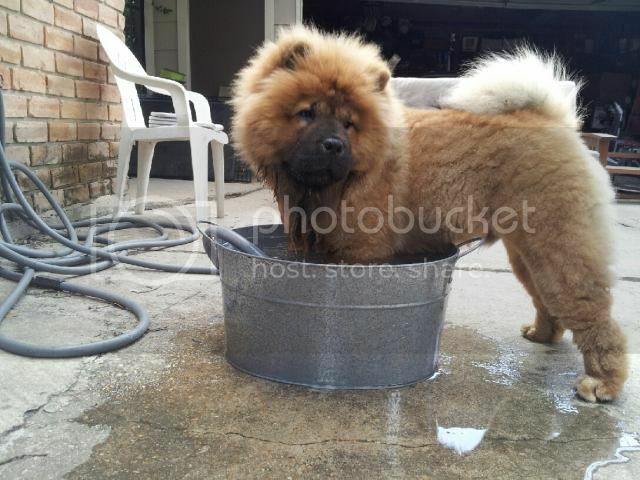 Chows dont like getting wet too much so maybe he is feeling a bit hot. Cam Atis wrote: It shouldn't bother you too much that Chance has wet bib area most of the time. By the looks of it with his paws inside the bucket of water, he loved cooling his paws. Just let him be. No need to overly dry his fur all the time as it will dry out naturally. Brush his fur instead once it is semi-dry. 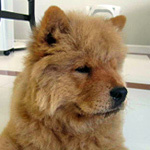 Chows dont like getting wet too much so maybe he is feeling a bit hot. I wanted to update and respond. Chance LOVES water! He lays in the wading pool, chases the sprinklers, and cries to go out in the middle of a rain storm. I have to put a leash on him and force him back in the house when it is pouring outside. ... I am hoping that he out grows the sloppy drinking because his neck is always moist except after a blow dry. I do towel dry him as often as possible... but leaving him to dry naturally... well, he would probably be growing mold or half of a vegetable garden by now. I know this is an older thread, but I'm relatively new to the site so hopefully any one reading this in future will find this helpful! I use the "stay dry water dish" with Moose and it works like a charm!!! He's only 4months so his bib is not completely in yet. 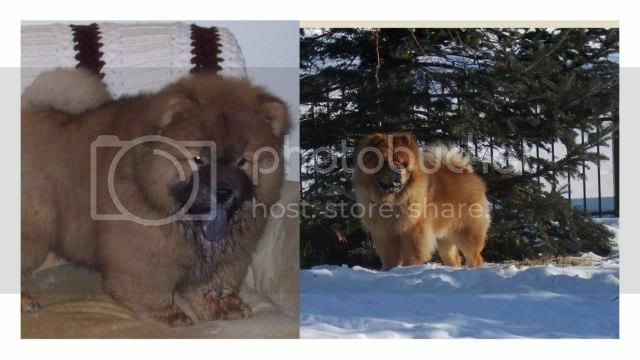 But when I got him at just a couple months his whole face and chest would be sopping wet after a drink from his water bowl. He would then drip drip drip all over the floor. It has a rotating wheel that picks up the water. It's also great for travel as it has a lid so you know the water won't splash and spill. That dish is very cool looking. I wish I could test one before spending the money. Spartacus's bib seems to be wet all the time. He just turned 11 months but as soon as it began I started using the blow dryer on him. The dryer use to scare him so much that just the look of it was enough. Now it doesn't bother him at all which is nice. Last week I decide to trim his bib to even it out for a show coming up. Now it gets less wet and is easier/faster to dry. Plus he looks better IMO and if he didn't go to shows I would trim it further. We are getting the new puppy used to the dryer. She was fine with blow drying her bib. BUT... when I gave her a bath and dried her from head to tail, she freaked out a bit.